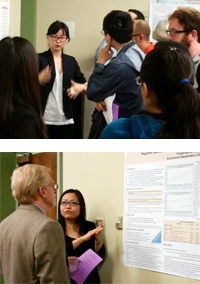 On Monday, Sept 29, 2014, six graduate students presented their research at the Economics Graduate Student Field Paper Poster Session. In attendance were economics faculty and graduate students, along with dean of the graduate school William Fisher. Click on the links below to view posters. Malcolm O. Asadoorian III, Ph.D., currently Academic Dean of the Regis College School of Liberal Arts, Education, and Social Sciences (SLAESS) has been appointed as Vice President, Academic Affairs, effective immediately. Dr. Asadoorian came to Regis from Lynn University in Boca Raton, Florida, in 2012, where he had served as a Professor of Economics in the College of Liberal Education and the College of Business and Management as well as Associate Dean for Assessment and Faculty Development in the Office of Academic Affairs. Prior to his appointment at Lynn, Dr. Asadoorian served as a Post-Doctoral Research Associate Professor in the Massachusetts Institute of Technology (MIT) Joint Program on the Science and Policy of Global Change; Visiting Associate Professor & Interim Director of Boston Continuing Education at Fisher College; and Associate Professor, Division of Business, Law and Public Policy at Anna Maria College. Dr. Asadoorian earned his Ph.D. in Economics from Clark University in Worcester, MA, with a dissertation that integrated geographical information system (GIS) spatial data with economic modeling techniques to study environmental awareness, inequities, and justice.